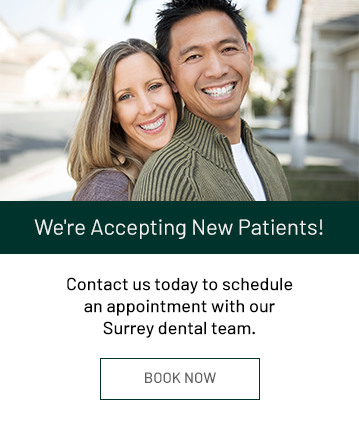 Dr. Asmaa Seddik and Dr. Marwa Salman at Guildford Smiles Dentistry in Surrey offer their patients dental implants to replace their missing teeth. They have the training, expertise and experience to provide you with comfortable, accurate, and successful dental implant placement and restoration. In some cases, removing a damaged or infected tooth is the best way to protect your health and comfort. When it is necessary to extract a tooth, we are committed to restoring your smile so that you can eat the foods you love, and speak and smile with confidence. Dental implants are permanent teeth replacements that are surgically implanted into the jawbone, and capped with a dental crown. As a result, they can restore the appearance and function of your smile, and also help to retain precious bone material in your jaw. The Titanium Implant - The titanium implant is a tiny, conical titanium screw that we surgically place into your bone. Over a period of several months, your dental implant will integrate with your bone, creating a stable foundation. A Custom Abutment - The abutment is an attachment that is added to the exposed part of the implant to create a support base for the implant crown. A Custom Crown - The visible part of your dental implant. An implant crown is a porcelain restoration designed especially for you that looks and feels like a natural tooth. We match the shade and shape to complement your smile so that it appears seamless. When you lose teeth, the bone that supports those teeth begins to resorb. This can cause your remaining teeth to shift, tip, and move as your bone deteriorates. Dental implants mimic your natural teeth both aesthetically and in function. A dental implant anchors within your bone, preventing deterioration and creating stability. Single dental implants will be similar to your natural teeth, and you care for them the same way. Regular brushing, flossing, and routine dental check-ups will help keep your dental implant healthy and provide many years of service. If you require a bridge or dentures, dental implants can provide additional support to your dentistry. By using a combination of dental implants and bridgework or a few strategically placed dental implants, you can enjoy added stability and function.